It’s late November. Morning light has not yet worked its way through the cool gray fog and wood-fire smoke that envelops the airport. Trees and traffic and darting people are mere wisps in tones of pale grey. But still, India looks like India—mysterious, timeless, and to me very welcoming and thrilling. I love India. My driver from the Aman New Delhi hotel is waiting amid the airport multitudes (with a wooden Aman sign, how chic). I am instantly enveloped in his quiet efficiency as he opens the passenger door and his assistant swings my luggage into the trunk of the hotel’s classic thirties-style pale taupe Ambassador. We move slowly through the throng, and into the leafy avenues. Women in muted winter saris muffled with grey and brown shawls pass by purposefully. ‘Ma’am, did you have a pleasant flight?” said the handsome assistant, seated in the front passenger seat, left side, British style, offering me a bottle of water. Yes, thank you, to both. Inside the taupe leather-seated Ambassador, all is calm. Finally, the assistant phones the hotel to report we expect to arrive in three minutes. 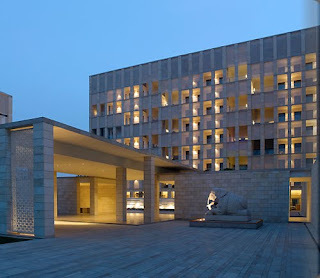 We turn from Lodhi Road into the monumental stone territory of the Aman New Delhi. The hotel opened earlier this year, and I have seen only one or two photos, so I don’t quite know what to expect, how it will feel. At the front entrance a group of handsome men in taupe tunics take the luggage, General Manager Henry Gray welcomes me, and I am swept inside the hotel, past a large carved black stone water basin filled in which float brilliant orange marigolds. The butler returns with a glass of fresh-squeezed pomegranate juice. This, for me, is the ultimate Indian luxury. There are many others. On the floor beside the bed are the most comfortable boiled wool booties in taupe. They look Bhutanese. And over beyond the desk and through a tall shuttered door, is my terrace. There’s a restful view of gardens and trees and Hamuyan’s Tomb in the foggy distance. Wait, there’s a plunge pool, heated. A cantilevered chaise-longue. Breakfast arrives. English Breakfast tea, of course, and wheat toast. House-made orange marmalade. Bitter/sweet. I read the Times of India Crunch. Linger. But I have things to do. The hotel has arranged a trip to review the great architecture of Lutyens’s imperial Delhi, then onward to the marigold-wreathed flower market, and to Chandni Chowk, that raucous, mediaeval, shrieking and over-stimulating market with saris and jewels and fabrics, and dhoti-clad characters in twirls of turbans, and rickety bicycles and boot-legged electricity. What century is this? ‘Madam, fine silks’, ‘Madam, we can make you a jacket’, ‘Silver bracelets, Madam’, ‘Come, Madam, fine hand-woven cotton”. I smile. Next time. 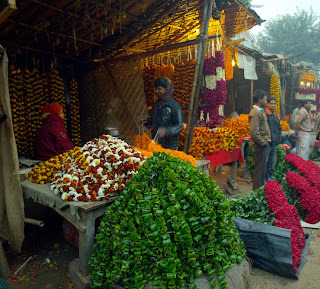 “When I first arrived in New Delhi in 1984, I used to slip out and explore. I would take a rickshaw into the innards of the Old City and pass through the narrowing funnel of gullies and lanes, alleys and cul-de-sacs, feeling the houses close in around me. In particular, what remained of the 18th-century palace of the last Mughal, Bahadur Shah II, the Red Fort of the Great Mughals, kept drawing me back. I would often slip in there with a book and spend whole afternoons in the shade of a cool pavilion. Delhi’s relationship with its past continues to intrigue me.” —From 'The Last Mughal’ by William Dalrymple (2006). Old Delhi. Chandni Chowk. It’s a visual upload this morning, not commerce. Back to the hotel spa for my massage. 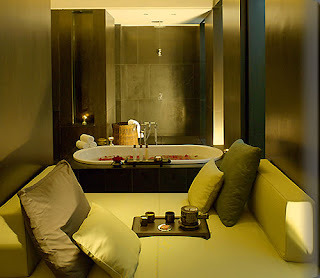 If I were to dream of my ideal spa, this would be it. Muted light, softest sounds of bells and Indian chanting. A masseuse from Mizoram. Dark rooms, dark woods, out of time and out of mind. It’s two hours of Thai massage. I’m never leaving. Privacy is perhaps the most precious travel luxury. I never see another guest on this stay. 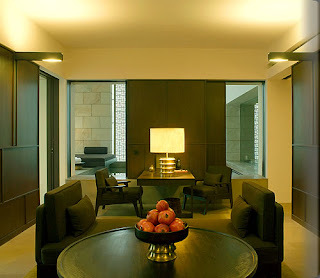 Aman-style, this feels like a private residence (if only). There are no signs, staff greet me by name, it is all very discreet. There’s time for a frisky and fresh organic salad and more pomegranate juice before friends send their driver to gather me up and take me out to their Farmhouse (actually a luscious new house an hour from the city center in a tree-lined estate, once surrounded by countryside.) Afternoon fades into evening, and I return to the hotel with friends long after midnight. 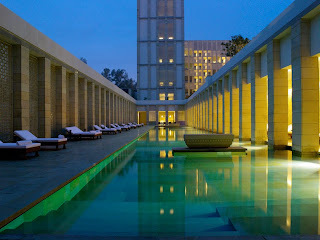 Over the time of my stay, I discovered, on request, that the hotel is set on 6 acres, has two wings, nine floors, thirty-nine rooms and twenty-eight suites, and that there’s a panoply of restaurants, a hair salon, a lap pool, plunge pools, jaali screens to modulate light and intense outdoor heat. It’s Aman’s first city property, as it happens. They have taken the hotel-as-private-retreat concept that they’ve done so well in remote and dreamy places like Bali and Sri Lanka and Bhutan, and brought it to this urban setting. Even with the cavalcade of Indian life rushing outside, the hotel feels hushed, cathedral-like, and ultra-luxe. Today it’s onward to Jaipur and then Ajabgarh and the Aravalli hills. I left the hotel in the same taupe Ambassador, feeling like a maharani with my handsome driver and cheerful assistant. They had asked me if there was anything I would like for the drive. I said, slightly whimsically, ‘English breakfast tea’. “Well, this looks lovely here,” I improvised, and we passed an equestrian school, with perfectly postured young women exercising their thoroughbred horses. The driver pulled into a side street near the equestrian ring. Wordlessly, as if he did this every day (he did not) he took out a wicker hamper from the trunk, and set forth a teacup and saucer, milk, sugar, a Thermos of tea, and a teapot. He poured the hot tea into the pot, and poured me a perfectly fresh brew. I sat there in the shade, time out of time, watching the riders, sipping, writing Indian couplets in my head. Singing, perhaps. Tea completed, he packed up the hamper and we continued on, unhurriedly, sedately, to the airport. I can’t recall a more pleasant ride to any airport. 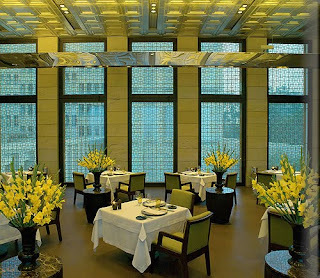 Aman New Delhi is a dramatic property. And it’s the thoughtful, low-key and cheerful staff that takes it to another level. You have such style in everything you do. (like tuberose's) I love them.. Thank you for this lovely post at Christmas ..
May you be happy, well and and loved. One of the very worst things after a long flight is the pain of the check in process. What heaven you have described! That alone could send me rushing off to India. it is such a gift to have been able to take this lovely trip. money and your 'time' are both luxuries that made this trip so possible & fabulous. Fascinating. I am very familiar with Aman Resorts, (there is one in Phuket), and interested that they have branched out into city properties. Their design of this Delhi one is indeed quite stark, (from the outside), but once you're inside it perhaps doesn't matter. Kerry Hill has designed The Suhothai Hotel here in Bangkok, which is next door to where I live, and about which I have posted previously. I like his style and clean lines very well indeed. 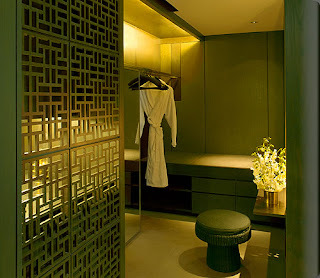 I knew the Amanresorts from my previous life, a week in Phuket was pure bliss (even though the contrast with real life in the street was even greater and bothered me a little to return to such luxury each time we ventured out). I can just imagine how I would feel in Delhi, following your steps (tea included). I will keep dreaming! Great hotel tip, Diane. Beautiful images; many thanks. 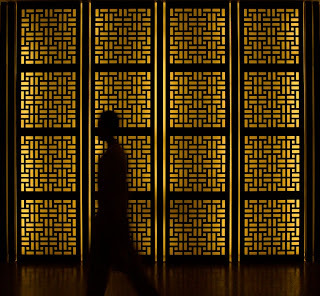 This new Aman hotel was a bold decision on the part of Aman. I believe it is a magnificent success--and the modern lines and rigorous architecture are gloriously simple in a country that thrives on embellishments and ornamentation. The architect's statement is fantastically astute--and KERRY HILL is right that the worse way to approach new architecture in India is to simply take existing models and replicate them or even copy them without thought. Looks like you had an amazing time in India! I would love to be able to go on a big trip like that! Just stunning! I love the style of this architect! I wish you a Merry Christmas and a fabulous 2010!! I discovered your blog trough 'Belgian pearls' and I'm reading non-stop all the interesting subjects you're writing about! I loved very much your article about Inia. I have been 14 times over 20 years. Last year my daughter & I traveled trough Rajastan, just the 2 of us...it's not easy to discribe this country but you did it in an amazing way! Wishing you & your family a merry xmas & a very happy and inspiring new year. You are so kind. Thank you. I appreciate your generous and wonderful comments. They spur me on. I am grateful for your quote from Jung--who has inspired so much insight and guidance over the years. INDIA: It's a writer's paradise. It's a traveler's paradise. I am shooting sparks...I am hallucinating...I am alive to every sound and texture and current of air and scent and jingle and jangle and shout and shriek. I can't wait to return. It's the most dissonant and harmonious place, and each moment is like the universe colliding. I will follow your travels in the far north--on the archipelago and yonder. Blue yonder. Reminds me a little of the Neue Galerie in New York --such a wonderful limited palette. 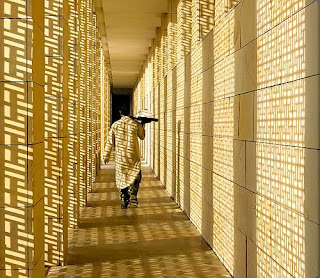 Came to your blog via Maryam Montague (My Marrakesh) a chum from our Morocco days. 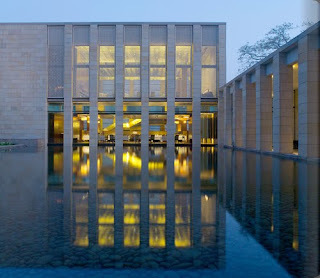 I am such a fan of the Aman resorts and would do a world tour of them if I got half the chance! I love the look and the service is excellent. 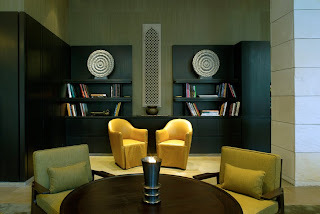 I recently stayed at the Aman in Cambodia and it was more pared down but presented a very elegant sixties style. My only criticism would be that sometimes the lighting is a little dark in them?